Look at that little body builder! 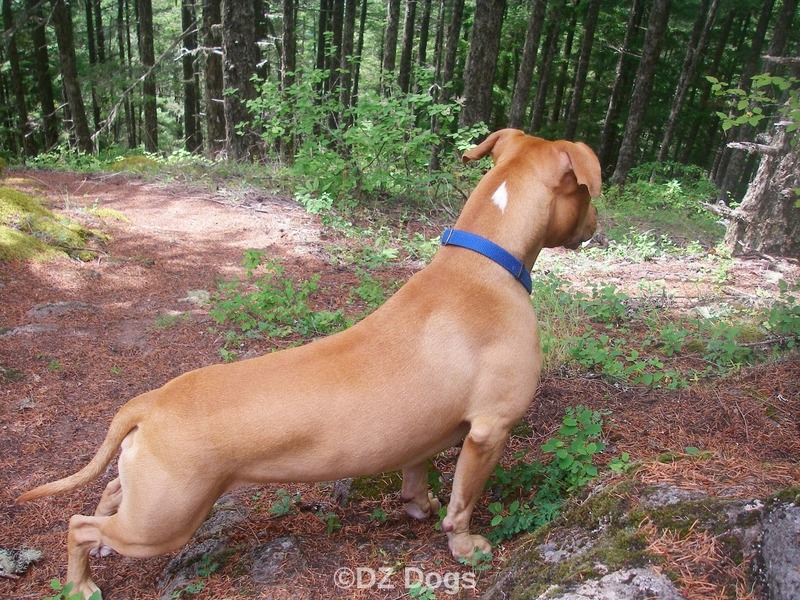 With her slim waist, broad chest, big shoulders, and wonderfully square head our little gal Ziva is an adorable little body builder but hard to fit! 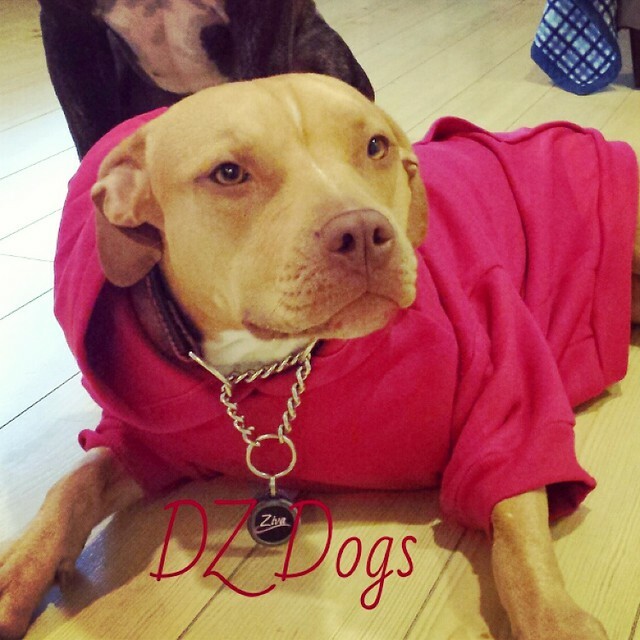 A while back we ordered this wonderfully cozy sweatshirt from PitBull Gear - Here's our review. It fit her perfectly at her shoulders but was way too baggy around her waistline. It has taken a while for me to break out the sewing machine but with the nasty weather I finally altered her sweatshirt and now it fits perfectly! So in case your pup is hard to fit, here's how you do it. Zipper - You could use velcro instead! Sewing Machine if you have one! 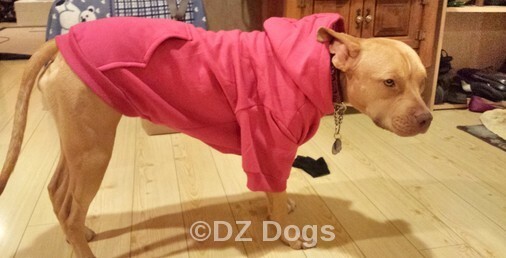 Put the sweatshirt on your dog, and using safety pins (not straight pins!) pin first where the proper fit stops, for us that was right below the front legs (top pin). 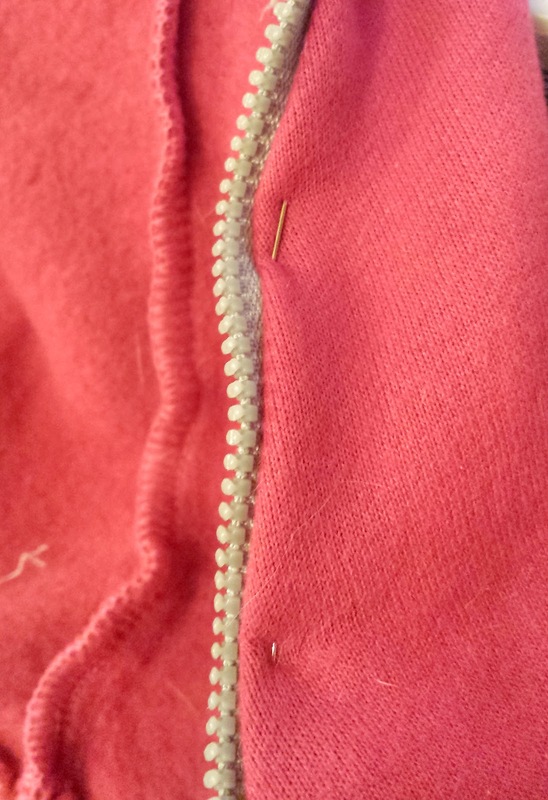 Then pull the sweatshirt in under your dogs tummy and fold it, then pin on each touching fold - these two points should touch for a perfect fit (bottom two pins). If the bottom pins were to touch it would fit great! 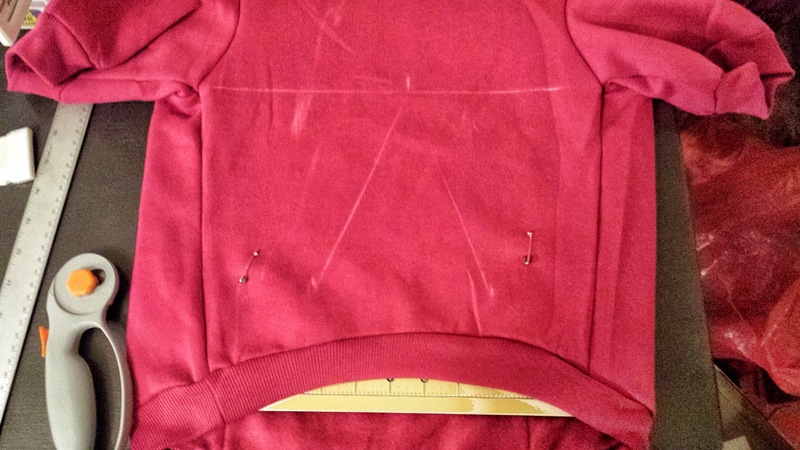 I placed a rotary cutting mat inside the sweatshirt so that it would lay flat and I wouldn't have to worry about grabbing the wrong side of fabric by accident. We are going to be smart about this so please don't cut yet! If you cut now you will not have allowed for any stitching and you are going to end up with a sweatshirt that is too small. Take a ruler and measure in from your mark on each side, at least 2 inches. Measure in more if you want a looser fit. Then measure in from the side seam line and make sure you match each distance in from the outside seam, we don't want a lopsided sweatshirt. If you are slightly off, better to err on the side of slightly larger than too small. 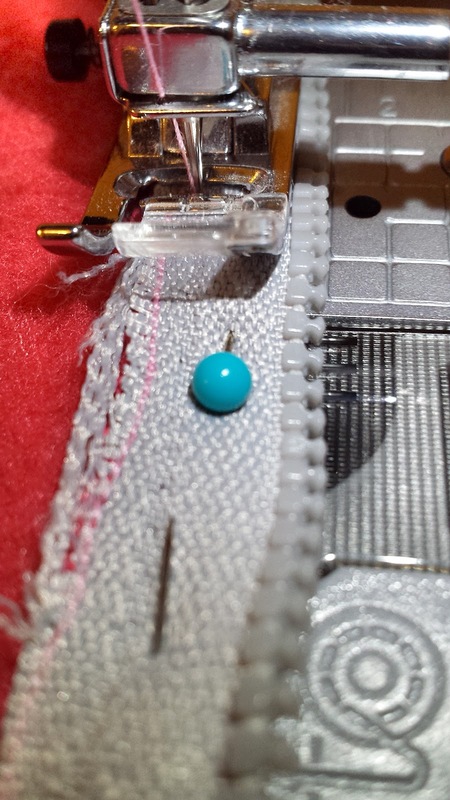 My final mark was 3 inches in from the outside seam line, on both sides. Draw a line straight across the top pin. And then draw a triangle connecting your two bottom marks to the middle of the top line. Now for the scary part, using a straight edge cut out the triangle portion. I used a rotary cutter and board designed to be cut on. 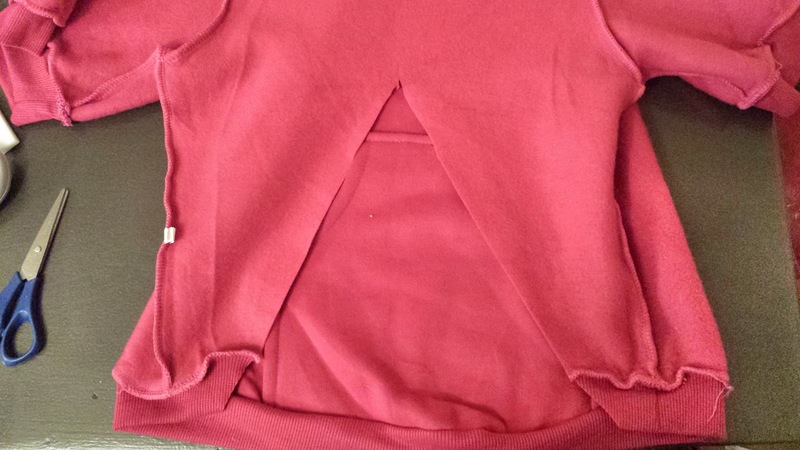 Be careful to not cut the backside of the sweatshirt! Step 5. - Flip It! Now flip your sweatshirt inside out. It is now time to install your zipper or velcro. 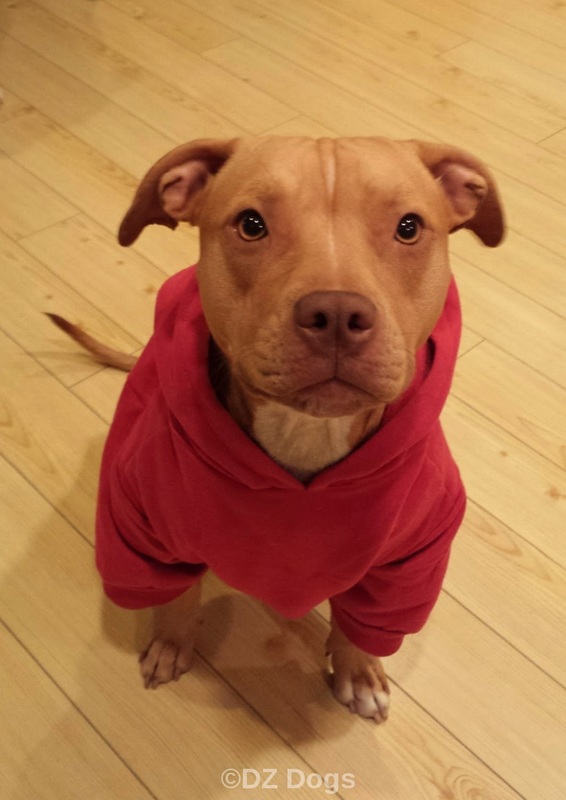 At this point if you were to sew the sweatshirt shut you would create a sweatshirt that would fit perfectly around your pup's wait but would be too small to fit over your pup's head. How would I know this? Well because I did it and then had to rip the seam out. Silly me! My Zipper was too long and had to be cut down to size. 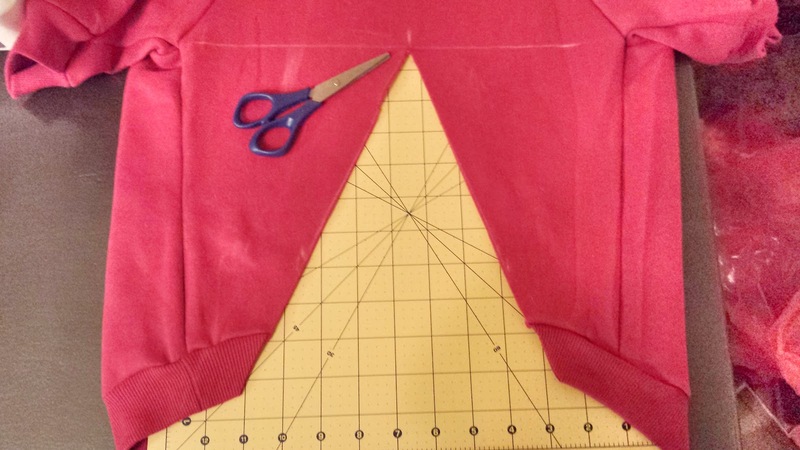 Measure how long you need the zipper to be so that the top of the zipper is at the top of the triangle, and the zipper stops at the bottom of the sweatshirt. 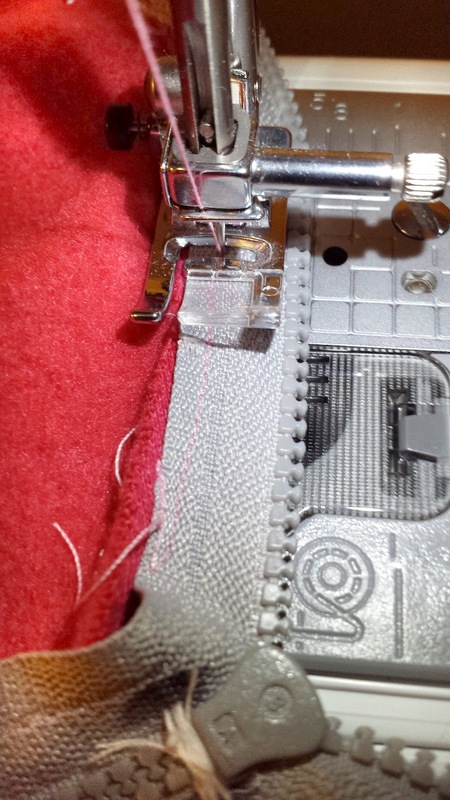 Mark on the Zipper where the top needs to be, securely stitch the zipper so that it has a new anchor, and then cut it down to size. 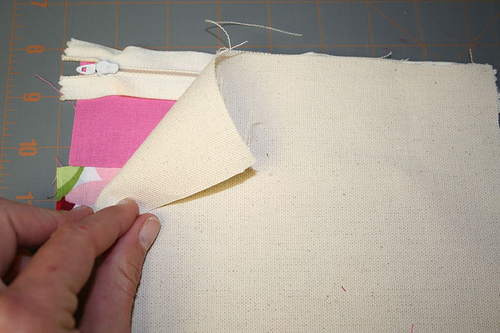 Here is a great video to show you the proper stitching. Pick one side to work on first. Work each side one at a time through each step. 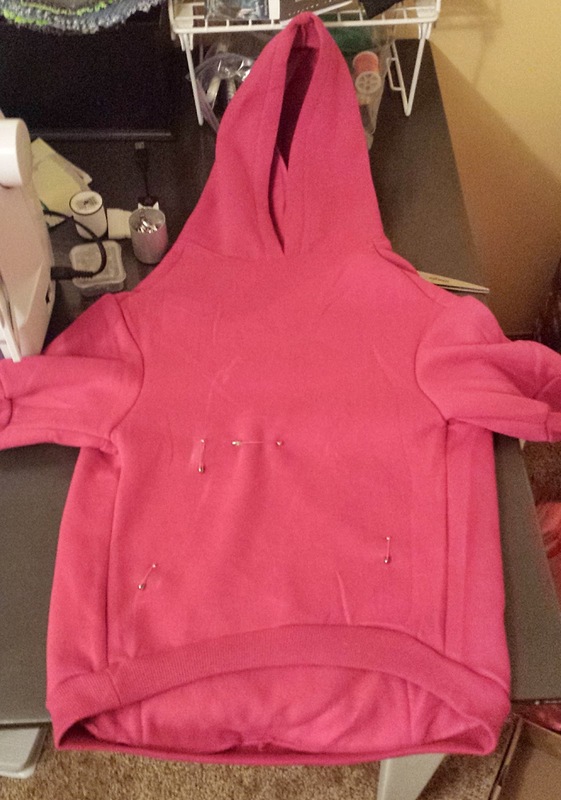 Put the front side of the zipper to the front side of the sweatshirt. Stitch along the edge. Now do the same thing to side #2. Sorry I didn't take a picture of the sweater for this! 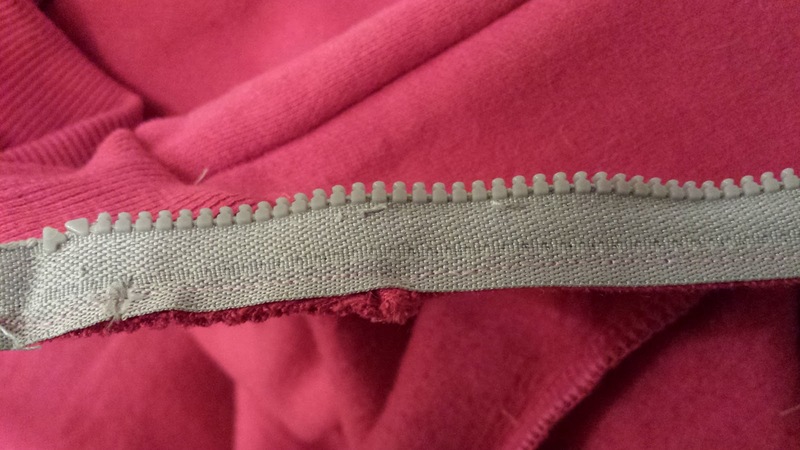 Here is the stitched edge, you can see it barely in the light pink line. 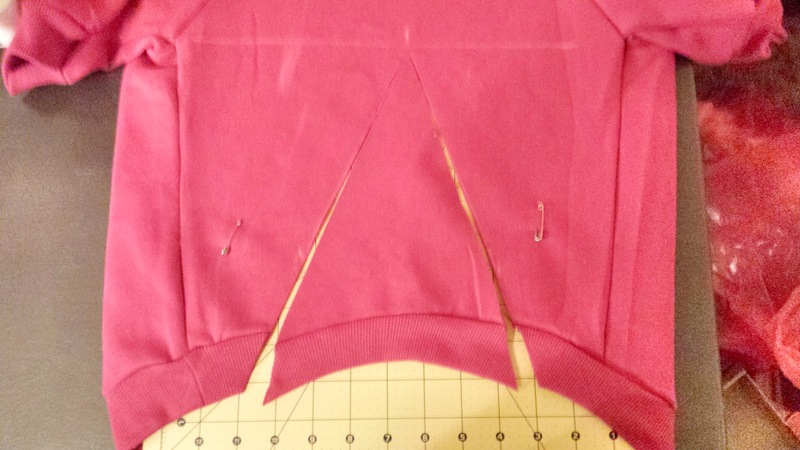 On the first side: Now fold the zipper back so that the ragged edge is folded under, and fold the fabric to create a nice edge that will be seen on the outside of the sweatshirt. 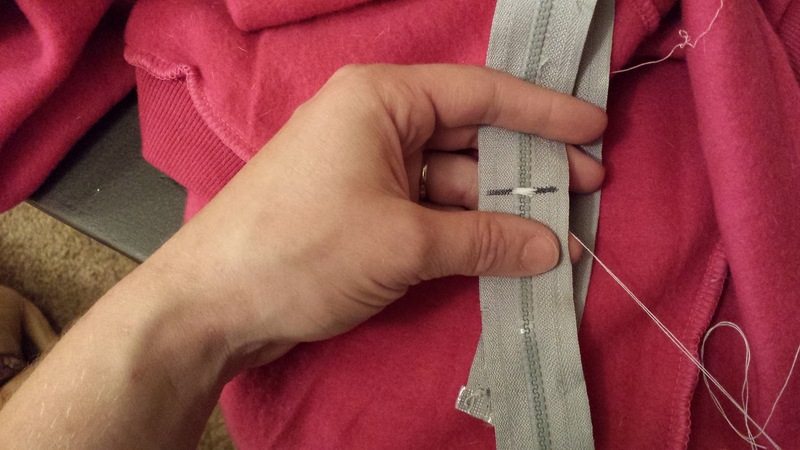 Use straight pins with the heads on the inside, and fold the fabric up to the teeth of the zipper. Now stitch it from the back. Because you folded the fabric it will create a nice cover to hide the zipper in. The ugly edge will be on the inside and the nice edge will be seen. The second side gets a little tricky, especially at the top, but you can do it! 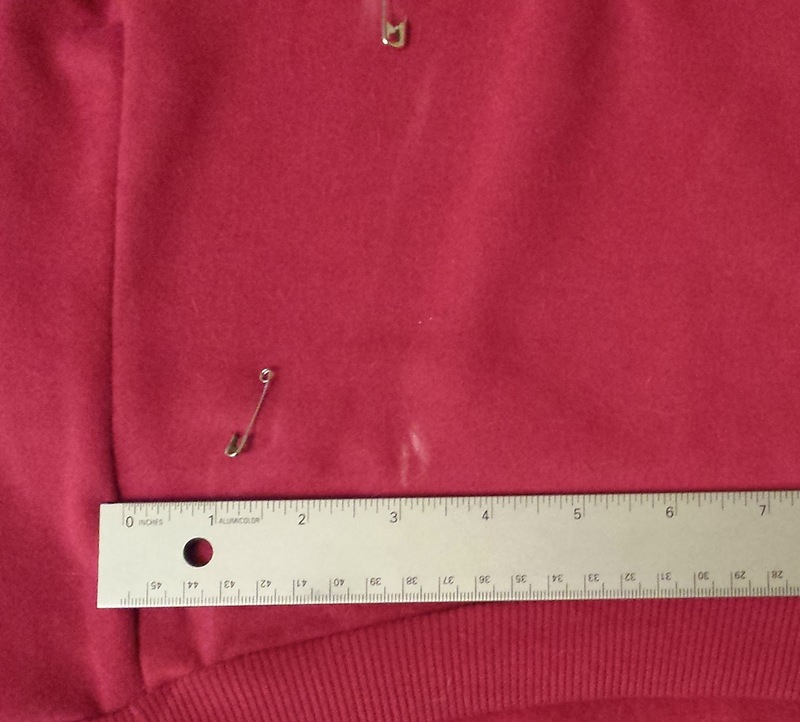 For the top, I stitched a "U shape" around the zipper anchor to make sure it was securely attached. Ziva loves her sweater! She just looks silly here because I was making her pose for a side picture. 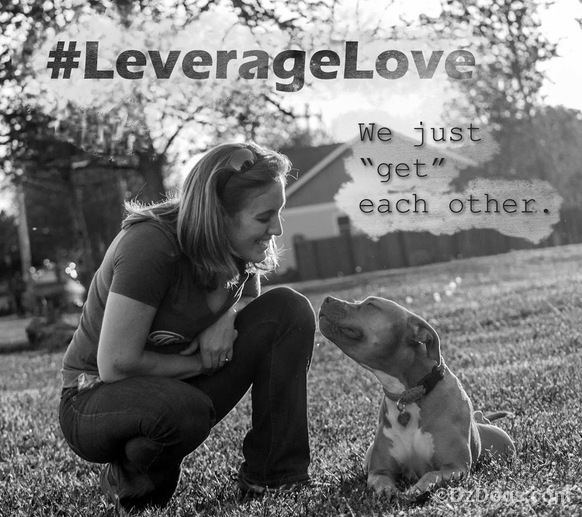 Thursday's Barks & Bytes hosted by 2 Brown Dogs, and Heart Like a Dog. Gosh you sure made that look easy. I think I would still go with Velcro over a zipper...lol. The sweatshirt came out great! Thanks so much for joining the hop. Ya velcro would work great! What a cool idea and the photos and instructions are so helpful. I'm going to try this after the holidays when I have more free time. i'd love to hear how yours turns out! Keep me posted! You are a very clever Mom! I haven't dusted off my sewing machine in a long time. You really got a great result. I'm thankful my dog came with her own thick coat because I'm hopeless with a sewing machine. Because I've always had dogs with double coats, I need regular reminders that some dogs need a little help in the cold weather. 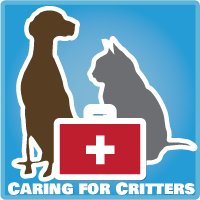 When I foster a pit mix or other dog with a short coat, I'm always scrambling to look for something to help them stay warm. Oh, yes! I bet your goldie with her floofie tail and long coat is perfectly cozy! I think I've only forgotten once..and I felt like a horrible mommy! Ziva shivers uncontrollably if she's outside and its cool - she does fine if she's running and playing. So our winter walks always involve a jacket or sweater, and anytime we go somewhere with the pups I am really good about bringing several sweaters in case the dogs get one dirty or we need to do layers. omg - look at you! I'm going to save this for the day I (1) have a sewing machine, (2) the inspiration to actually use it. Haha. 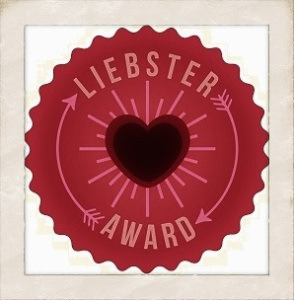 Thanks for sharing, pinning this :). You're welcome!! Let me know if you end up doing it, I'd love to see any improvements you come up with/things you learn! Brilliant idea. Will definitely be trying this when my little one is bigger!